The Ladies of the House has had a lot of hype around it, and is a big new title for Picador (a publisher I’ve found to be reliably quite good). The cover alone intrigued me when I saw it shared over and over on Twitter, and I had to get in on the action and read a copy! And luckily once I had a copy it became part of my TBR20, so I am doubly pleased to now have read it. Sometimes you just want to see what a book is like, whether or not you think you’ll like it. I did have high hopes for this one though. 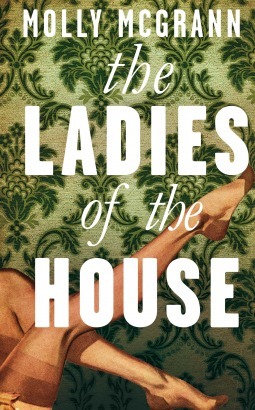 For a book with such a beautiful cover, there is sadly not much beauty in The Ladies of the House. This is for two reasons: the lives of its characters are far from easy, and they all experience their own heartbreaks and tragedies; but also because I found it a very trying and unpleasant book, unfortunately. Sometimes you can read about tragic stories, sad lives, and still find the story beautiful, either because of the language and/or because of the emotional depth of the story, or something similar. However, reading The Ladies of the House, I just thought ‘how awful’, and wanted to read and think about something else. I think this was because of the crucial fact that I didn’t like any of the characters and found them all quite difficult to sympathise with. Given that they are all women (the central characters at least) and go through uniquely women’s struggles, you’d think that I, a female reader, would be able to to feel for them – but most of the time McGrann’s writing was just so matter of fact, there you go, that happened, that I couldn’t connect. I didn’t feel that the characters needed to redeem themselves, but I did need something to make them more human and more real – too often they were a portrait, a template, and without the depth needed for the reader to connect, sympathise, become involved. Generally I liked McGrann’s writing, but as I say I did find it a bit matter of fact at times. While also making it difficult for me to connect to the characters, it also meant I couldn’t like the book as a whole, despite the characters. I thought the structure of the story worked well, with the jumps thorough time executed brilliantly, but a problem occurred when the dramatic opening section didn’t tally with the somewhat anti-climactic ending. The opening sequence implies a great mystery, great drama, something to be discovered. Instead we are taken through the long and unhappy lives of the characters, all the way to an ending that links back the beginning – but in the most unexciting way, ending abruptly and without closure for the reader. I thought, oh, is that it. That wasn’t worth it. Published in March 2015 by Picador. My copy was kindly provided by the publisher for review.